Of course we should ban all nonessential travel from Liberia, Guinea, Sierra Leone and any other country badly hit by the Ebola virus. How many flights a day does he think there are? As far as I can tell, there are none. Should we ban all connecting flights? If you do not have a fever or have obvious symptoms, you are not contagious. You get off the plane in Paris and develop a fever and somehow someone in the airport is exposed and infected by your sweat. 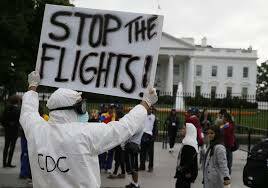 That person gets on the plane to the United States and for up to 21 days may be able to transmit the disease. Maybe a travel ban means stopping all air travel except for “my” flights. Now is what Stephens really means is that we should ban anyone who holds a passport from those countries? Or maybe all people who look like they are from Liberia, Guinea, etc. Maybe Stephens just believes that we should say we implemented a travel ban to placate the public. All of these meanings are unacceptable. It’s also about the panic that even a handful of cases can stir in the public, and the inevitable economic and political costs of managing that panic……These are the kinds of everyday psychological realities so often missed by the experts—by people who are, perhaps, too smart to comprehend the dumb world, or too arrogant to appreciate that the dumb world doesn’t always bend to their designs. This is, in my opinion, hogwash. The world is not dumb, but it is in need of education. Experts do miss psychological realities, but they should not make up things to placate hysteria. The travel ban is just another dumb idea that can take over when we rely solely on our “gut feelings.” “Yeah, that’s the ticket.” It is based on no evidence. Government should not be bullied by mass hysteria into doing something it cannot do and something that will not work if it could do. It would be a waste of resources that need to be better utilized. Stephens wants a larger role for “incompetent” government than it can handle. Maybe, he should rely on those private sector airlines to do what is needed. Many flights out of those countries have already been stopped. Kenneth Hammond (for instance, post Beyond Rationality Part 3) is good at helping me see that how we make decisions is important. His concepts of coherence and correspondence are useful in judging decision making. Hammond sees both measures as appropriate and indispensable, but I think it is his judgment that the world is becoming less linear as we learn more and that coherence must have the upper hand when the ecology is nonlinear. Our intuitions do not work well in such areas. Ebola is definitely nonlinear. Our senses cannot detect it and the latent period is so long that a direct connection is forgettable. We need experts that can make coherent and consistent arguments to communicate the risk to us accurately. A great many of the West Coast people distrust the Japanese, various special interests would welcome their removal from good farm land and the elimination of their competition, some of the local California radio and press have demanded evacuation, the West Coast Congressional Delegation are asking the same thing, and finally, Walter Lippman and Westbrook Pegler recently have taken up the evacuation cry on the ground that attack on the West Coast and widespread sabotage is imminent. My last advice from the War Department is that there is no evidence of imminent attack and from the FBI that there is no evidence of planned sabotage….It is extremely dangerous for the columnists, acting as “Armchair Strategists and Junior G-Men,” to suggest that an attack on the West coast and planned sabotage is imminent when the military authorities and the FBI have indicated that this is not the fact. It comes close to shouting FIRE! in the theater; and if race riots occur, these writers will bear a heavy responsibility…. This entry was posted in Coherence, Correspondence, Expertise, Risk communication and tagged Hammond on October 22, 2014 by admin.